I know, I know, understatement off the year. Not only are they just busy little people, but then they do all the things! Sports, school events, and the birthday parties. Holy God the birthday parties! And if you have more than one kid, it just gets exponentially more insane. If you don’t watch out, you can become completely overwhelmed, discombobulated and burned out. Weekends that you used to spend as a family or getting stuff done become a complicated dance of getting the right people to the right places and I lose any sense of recharge that I strive for on those two special days. Meanwhile, all you want to know is how to be less busy so you can enjoy life again. Unfortunately, the week isn’t much better. After a few consecutive weeks of…. Mom: Hi honey, whatcha doing? Driving to swim? Me: Nope, but I should be! Gotta go! …I realized that I was overbooked. I was forgetting an appointment I’ve had on the books for years, so who knows what else I didn’t show up to!?! So rather than get a new planner, cover my refrigerator in reminders or scold myself, I took stock of our activities. I prioritized. And I decided that figuring out how to be less busy was at the top of my priority list. Because we just couldn’t go on like this. We all have the rest of our lives to be busy and I couldn’t justify running my kids around from place to place. For what? T-ball isn’t going to get him into the Majors, music class isn’t going to make him the next Beethoven, and all of it costs more than just playing in the dirt. Which is basically his four year old dream come true. The same goes for the three year old. And the one year old. So I cancelled everything except swim lessons. And preschool 3 days a week for the bigs. Because we have a pool and my kids need to know how to swim, and we have a lot of kids and Mommy needs a break for 4 hours once in a while. And it is SO freeing. Because the truth is, we aren’t inherently busy. We are choosing to be busy. We want our kids to have every opportunity and all the experiences and not miss a single thing we can afford them. We foist on them our sense of FOMO before they even recognize the letters F, O and M. We sign them up for all the classes because we want to expose them to everything because someday it might be their passion. We fill our calendar so we’ll have things on the books because an empty week can be terrifying (at least for me it is!) We go to every single birthday party because they’re at a great place and the kids will have fun and we love our friends. But it’s just.too.much. And WE are the ones with the power to stop it. 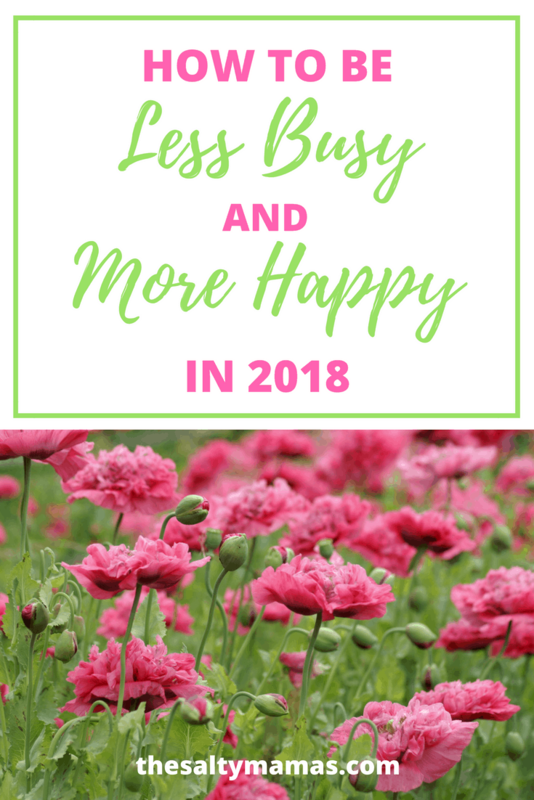 So as you come down from your busy-because-it’s-the-holidays hangover and are thinking about your New Year’s Resolutions, this about being less busy. Because you can be. All you have to do is choose it. How saying NO to all our obligations made me a better – and happier – parent! I am doing something similar but it’s me saying No to my own personal stuff. I’m the one who’s overbooked with events and obligations that aren’t necessary. So for the new year my calendar is open for new adventures with plenty of time for just hanging out and enjoying kid time ? Yes! I honestly use the kids as an excuse a lot. Like, it might me me that’s getting overwhelmed by STUFF, but I’ll tell someone, “Oh, y’know, we just have too much going on that day and it’s right at naptime…” I never regret it. The FOMO is dwindling. SO true! Once you realize you’re not actually missing out, the F part goes away! Great article..I shared on FB. The FOMO point really hit jome for me! Yes girl! Saying no leaves room for your best yes. I am constantly working on this! Finally!! Its so easy to get wrapped up in the FOMO! I’m down for learning to say no! Girlfriend, this is so amazing. I have recently embraced the word “no” and it is so relaxing and liberating!